Politician David Heurtel wants to see more zero emission vehicles (ZEVs) on the roads in Canada, and he wants Quebec to lead the nation in fostering their growth. 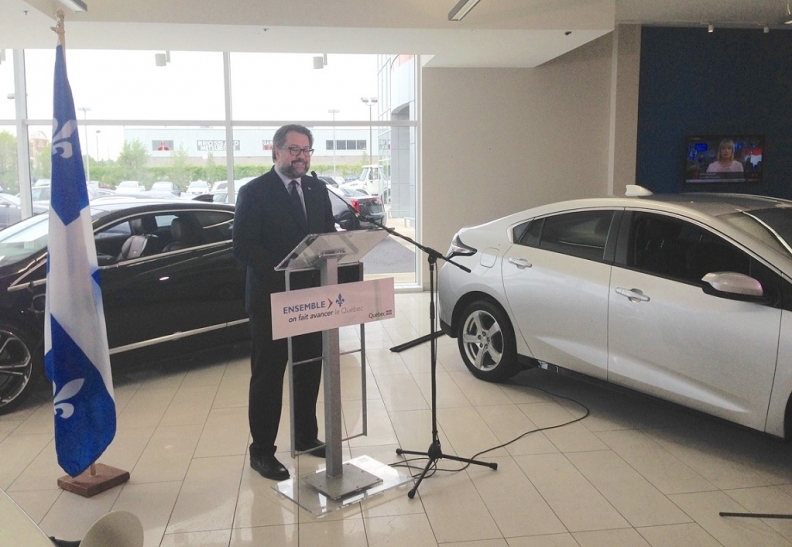 As Quebec's Minister of Sustainable Development, Environment and the Fight Against Climate Change, Heurtel in June introduced a bill in the province's National Assembly that if enacted will require automakers to sell or lease a minimum number of zero-emission vehicles (ZEVs) in the province through a tradable credit system. The law would apply to all automakers that lease or sell more than 4,500 new vehicles per year in Québec. "We are hoping not only to reduce our GHG (greenhouse gas) emissions, improve air quality and reduce our dependence on oil, but also move forward to a new economy stimulated by innovation," said Heurtel. The system would work much like carbon credits. Starting with 2018 models, automakers would have to meet a ZEV sales target, translated into credits, their value to be determined by the government. The target will be calculated by applying a percentage to the total number of light-duty vehicles that each manufacturer sells in Quebec. Car dealerships aren't directly subject to the legislation, only the automakers. Automakers that meet the required sales number, will face no penalty. If they sell more, they'll be awarded credits that can be sold to those that do not meet the minimum target. In the United States, a credit is worth USD$5,000. Automakers like GM, with the most popular electric car in the country, the Volt (and the upcoming Bolt compact), is in a good position to do well. Others, like FCA or Mazda that have no electrics on the market yet, will have to think of something, fast. However, governments should allow each automaker to come up with its own strategies to reduce emissions and meet regulations based on their own advanced technologies, said Mazda Canada in a statement, when asked by Automotive News Canada. Mazda bas been an industry leader in cutting vehicle emissions and improving fuel economy without resorting to electrification. Mark A. Nantais, president of the Canadian Vehicle Manufacturers' Association (CVMA), agrees. "Policies that force consumer technology purchase decisions, like a ZEV mandate, impact the selection and availability of vehicles for sale in Quebec, without first considering and addressing Quebecers' automotive needs, driving range, pocketbook, or access to re-charging at work, to get to work or wherever else they need to travel," Nantais said. The bill, to become law later in the fall if ratified, will give the automakers two years (2016-2017) to adapt to the new realities of the Quebec market. The law would go into full force in 2018.
an exceptional expertise in research and development, owing to internationally renowned researchers and a solid industrial base in ground transportation," added Heurtel. Not to mention that the liberal provincial government made a promise that 100,000 electric vehicles would be on the road by 2020. "We are not at 10,000 (yet), with only three-and-a-half years to go. The Bill would encourage automakers to do better with their EV, plug-in and hybrid offerings. After all, he said, every year Quebec consumers buy about 50 percent of all electric vehicles sold in Canada, "so there is an interest."